Introduction: Satraplatin has been given in combination therapy for lung cancer to utilize its radio-sensitizing properties. The optimal dose of satra-platin given concurrently with radiation therapy for locally advanced non-small cell lung cancer (NSC-LC) has not been defined. This phase I trial attempts to identify a maximally tolerated dose (MTD) and dose limiting toxicity (DLT) for Satraplatin given con-currently with radiation for locally advanced N-SCLC. Patients and Methods: 15 patients with histologically confirmed Stage IIIA/B NSCLC entered onto this study with four dose escalations (10 to 40 mg daily) of Satraplatin. Eligibility included patients with NSCLC and one of the following criteria: 1) previously untreated, inoperable disease and planned to receive radiation therapy to primary disease site; 2) previously resected disease with mediastinal relapse; or 3) metastatic disease in no more than one distant site. Results: The most common toxicities reported were all grades of fatigue (n = 9), nausea (n = 9), constipation (n = 7), fever (n = 7), and vomiting (n = 6). No DLT at the 1st, 2nd, and 3rd dose levels was identified. At the 4th dose level, one patient developed grade III elevation of liver function tests (LFTs) and a second patient developed grade III diarrhea with fever requiring hospitalization. There were 8 partial responses out of 11 evaluable patients for response (RR 67%). Conclusion: Elevated LFTs and diarrhea appear to be the principal DLTs of concurrent daily oral Satraplatin and thoracic radiation in the outpatient setting. 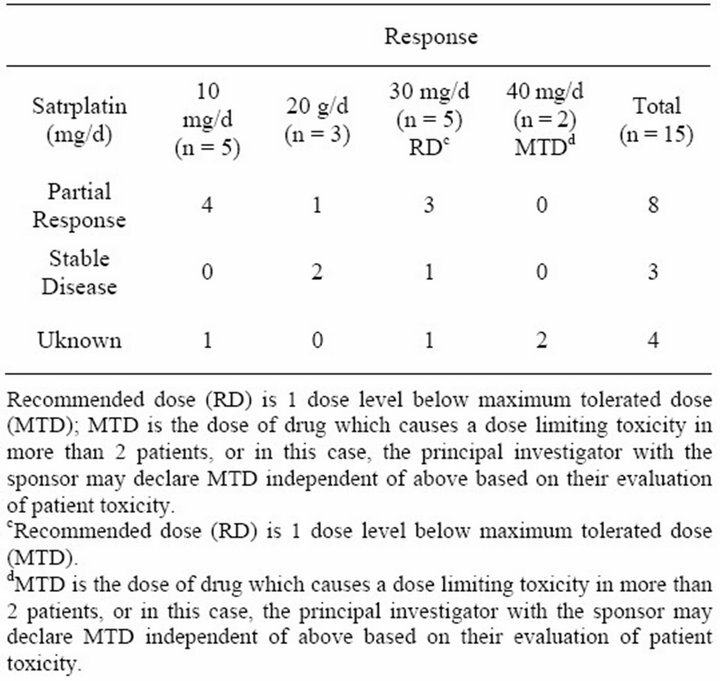 The MTD of concurrent Satraplatin with thoracic radiation therapy appears to be 40 mg daily. Lung cancer represents the leading cause of death and the most common oncologic malignancy worldwide. More people die annually from lung cancer than breast, colon, and prostate cancers combined. Nearly 60% of patients with lung cancer die within 1 year of diagnosis. In 2010, there were approximately 215,000 newly diagnosed cases of lung cancer and nearly 162,000 deaths, with that figure approaching 2.5 to 3 million globally. Five-year overall survival rates approach only 15% for lung cancer versus 65% for colon cancer, 89% for breast cancer, and 98% for prostate cancer . In general, our success at controlling lung malignancy has been very limited, with an overall survival of 15% historically at five years for all stages . Locoregional and systemic failures after treatment with multimodality approaches for lung cancer are significantly higher than for nearly every other cancer pathology and disease site. This is primarily due to the diagnosis of lung cancer at relatively late stages (presence of nodal and distant disease) and a general resistance to current therapeutics that leads to the reduced rates of cure for this cancer . Radiation therapy comprises one of the three modalities used in treating human malignancies—the other two modalities being surgery and chemotherapy/biologics. Chemotherapy and biologics are used for systemic control of tumors and as radiation sensitizers. Nearly 50% of all patient malignancies require radiation as part of their overall treatment regimens . Failure of local therapies such as radiation, concurrent chemoradiation, or surgery translates into local recurrences or persistent/ residual disease . The development of local recurrences can lead to significant morbidity, the potential for seeding of therapeutically resistant disease to distant sites, and mortality. The rate of local recurrences after radiation can approach 60% for Stage III patients within a five year period  . The approach of using combined chemoradiotherapy is designed to reduce the development of distant metastases by eliminating micrometastatic disease, while at the same time improving local control. Several trials have compared sequential versus concurrent chemotherapy and radiation therapy. Results indicate improved survival for patients who receive concurrent chemoradiation [6-10] . Since their original discovery, platinum compounds have emerged as important agents for the therapy of several human tumors including testicular, bladder, lung, head and neck, ovarian, and cervical cancer [11-13] . Cisplatin, an older platinum agent, is one of the more active systemics, with a response rate of about 14% in previously untreated NSCLC patients [14,15] . There would be many advantages to an agent similar to cisplatin which may be administered orally. There is now a platinum IV analogue, currently in clinical trials, that is orally bioavailable [16,17] . This agent is Satraplatin, formally known asJM216. Satraplatin (bis-acetato-am-minedichloro-cyclohexylamine platinum IV) is a third-generation, orally-administered platinum compound studied in a variety of tumors . The platinum analog, Satraplatin, is of interest for two reasons: it has shown activity in some platinum resistant tumor models in vitro, and unlike other platinum compounds, is absorbed readily when administered orally [19-22] . Preclinical studies with Satraplatin have demonstrated cytotoxic and antitumor activities comparable to cisplatin or carboplatin on lung, ovarian, and prostate cancer cells [23,24] . There have been two phase 1 studies to date exploring the combination of Satraplatin with radiation which have utilized variable thoracic radiation doses [2 3,24]. We performed a phase I trial of orally-administered platinum (IV) complex, Satraplatin to determine the maximumtolerated dose (MTD) and dose-limiting toxicities (DLT) with concurrent definitive radiation for patients with nonsmall cell lung cancer (NSCLC) (Figure 1). Satraplatin was given concurrently to optimize its radio sensitizing properties. 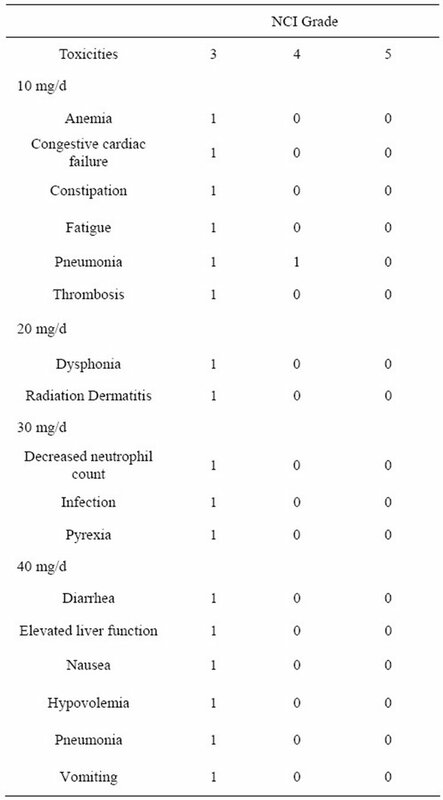 Table 1 describes the characteristics of the patients enrolled on the trial. Eligibility included patients with pathological diagnosis of non-small cell lung cancer (NSCLC) who met one of the following criteria; 1) previously untreated, medically inoperable disease and are to receive radiation therapy to primary disease site; 2) previously resected disease and have relapsed with mediastinal disease; or 3) limited, metastatic disease in no more than one distant site, age > 18, ECOG PS 0 - 2, adequate organ system function, adequate bone marrow function life expectancy of at least 3 months, and informed consent. Additional criteria for inclusion included adequate liver function, adequate renal function, adequate pulmonary function: FEV1 > 1.2 L, and patient ability to swallow pills. Finally, patients with previously treated brain metastases, with or without whole brain radiation therapy, that have been surgically resected or treated with gamma knife and have been stable for 2 months were considered eligible at the discretion of the primary investigator. Exclusion criteria included a history of NSCLC previously treated with chest radiation, patients who had a serious concurrent uncontrolled medical disorder, patients with uncontrolled or significant cardiovascular disease, including a recent (<6 months) myocardial infarction, any degree of congestive heart failure with or without medical treatment, any history of clinically significant atrial or ventricular arrhythmias, patients with a history of gastrectomy, pregnant or breast feeding patients, patients who had had prior radiotherapy to the primary tumor site, patients with untreated brain metastases, or patients who had received any investigational agent within 21 days prior to enrollment. Fertile patients were required to use effective birth control. Patients were given a trial information packet and were required to give written informed consent prior to enrollment into the trial. This trial was approved by the UTSW IRB. Satraplatin was administered daily, initially at 10 mg given five times weekly (50 mg/week), simultaneously with radiotherapy (Monday to Friday) for seven weeks. In subsequent cohorts of patients the dose of Satraplatin treatment was increased from 10 mg/d to 40 mg/d. Dose escalation of Satraplatin was in cohorts of 3 patients. Cohorts were expanded to 6 patients if DLT occurred that was attributable to Satraplatin. All patients received concurrent radiotherapy administered over seven weeks. Those patients who responded to the chemoradiation or had stable disease may have received 3 cycles of consolidation docetaxel chemotherapy at the discretion of the investigator. Endpoints of the study included determining dose limiting toxicity (DLT), maximum tolerated dose (MTD), and assessment of dose to be recommended for phase 2 trials with Satraplatin and concurrent chest radiation for patients with NSCLC. DLTs were defined as acute grade 4 non-hematologic toxicities or grade 4 hematologic toxicities occurring during concurrent chemoradiation therapy. Acute non-hematologic toxicity is defined to be a toxicity occurring from day 1 of study entry to day 1 of consolidation chemotherapy or within 60 days from the start of radiotherapy treatment, whichever occurs first. Grade 3 or 4 pneumonitis or esophagitis occurring during the acute phase and/or consolidation phase was also a DLT for this study. Finally, retreatment delay with Satraplatin of >7 days total because of toxicity was considered a DLT. MTD was defined as the dose of drug which causes a DLT in >2 patients. The principal investigator, with the sponsor, was allowed to declare an MTD independent of the above criteria based on their evaluation of patient toxicity. Recommended dosage (RD) was defined as the dose of the drug 1 dose level below MTD. Tumor response was assessed via RECIST criteria. For each dose level, up to six patients were accrued. After 60 days of evaluation, the current dose was considered acceptable if the first three patients had no toxicity, or less than three of the six patients experienced DLTs. Next, dose escalation involved accruing up to six new patients to the next dose level in the sequence. Otherwise, if three or more patients experienced DLTs, the current dose was considered too toxic, and the preceding dose was declared the MTD. At a given dose level, the probability of halting dose escalation when the true toxicity is 50% or higher is at least 65%. In addition, if the true DLT rate is instead 20%, there will still be a 10% probability of halting dose escalation at a given dose level (type I error). The MTD was defined as that dose level which causes, in three or more of six patients, any DLT and/or at the discretion of the investigator and the sponsor based on the evaluation of any DLT. Frequency tables with counts and percentages were used to describe pretreatment patient characteristics. Kaplan-Meier analysis was used in evaluating overall survival (OS) and disease free survival outcomes. An event in overall survival was death due to any cause. OS was determined from date of study entry to date of death or last follow-up. This phase 1 trial was not powered to make comparisons of efficacy endpoints between dose levels so only estimates with 95% confidence intervals were presented . The study opened in May 2007 and was closed by May of 2010 after accruing a total of 15 patients who were treated with four different dose levels of Satraplatin and concurrent radiation. Of the 15 patients enrolled, all were eligible and evaluable. 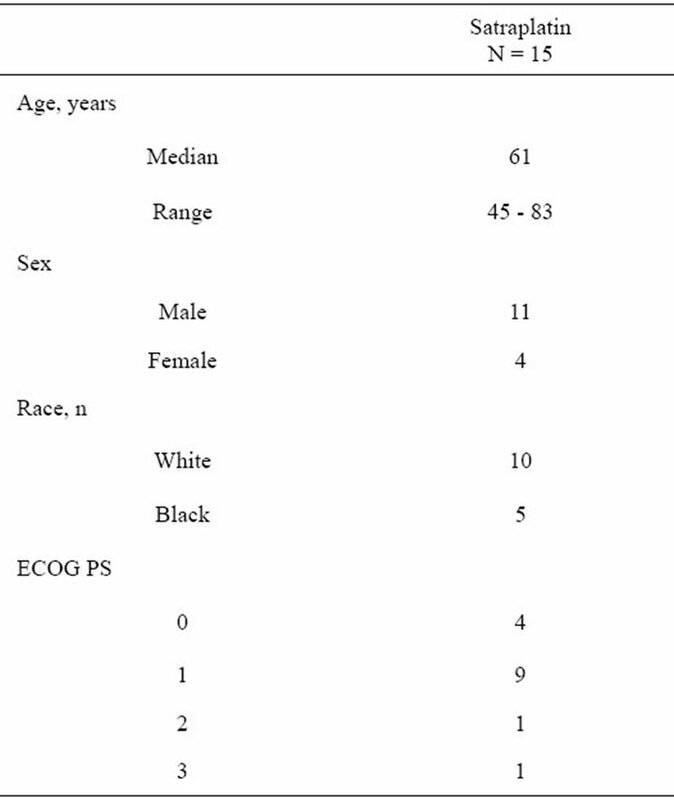 Of the 15 patients enrolled in the trial, the median age was 61 (Table 1). 11/15 patients were male and two-thirds of the patients were Caucasian. Four patients had ECOG performance status (PS) of 0, nine with ECOG PS of 1, and one each with ECOG PS of 2 and 3, respectively (Table 1). Figure 1 summarizes the treatment schema of the trial. Satraplatin was administered orally 1 - 3 hours prior to each radiation treatments: 63Gy/6 - 7 weeks. Dose esca lation of Satraplatin was in cohorts of 3 patients. Cohorts were expanded to 6 patients if DLT occurred that was attributable to Satraplatin. Satraplatin was administered Day 1 - 5 weekly for seven weeks. Consolidation with docetaxel at 75 mg/m2 q 21 days × 3 cycles was left to the discretion of the investigator and clinician. Table 2 summarizes the dose cohorts for the trial and Maximum tolerated dose for Satraplatin was determined based on observed dose limiting toxicities by the principal investigator and GPC biotech. These patients were treated with high dose radiation (74 Gy) in combination with the recommended dose based on current trend of trials evaluating high dose radiation in combination with chemotherapy in NSCLC. These 5 patients treated in combination with high dose radiation are not included in this analysis enrollment. There were four dose levels of Satraplatin used in the patient cohort: 10 mg/d, 20 mg/d, 30 mg/d, and 40 mg/d. Five patients were treated with 10 mg/d of Satraplatin, 3 with 20 mg/d, 5 with 30 mg/d, and 2 with 40 mg/d. There were also five patients not in cluded in the trial who were administered 30 mg/d Satraplatin with high dose radiation therapy—74 Gy in 37 fractions—consistent with the current trends of newer trials combining high dose radiation with concurrent chemotherapy. The MTD or maximum tolerated dose for Satraplatin was 40 mg/d as determined through examination of dose limiting toxicities by the principal investigator and GPC Biotech. Recommended dose (RD) is 1 dose level below maximum tolerated dose (MTD). In Table 3, we summarize the overall tumor response by Satraplatin dosage level. Best overall response was divided into partial response, stable disease (minimal response), and unknown response. In our cohort, among the five who were administered 10 mg/d Satraplatin, there were four partial responders and one unknown response. In the 20 mg/d group, there was one patient with partial response and two with stable disease. Within the 30 mg/d group, which represented the RD cohort, there were three partial responders and one each with stable disease and unknown status, respectively. Finally, in our MTD of 40 mg/d, there were two patients with unknown responses. Table 4 highlights the NCI defined level 3 - 5 toxicities based on dosage level. In the 10 mg/d group, there was one grade 4 toxicity—pneumonia. There were no other grade 4 or 5 toxicities at any of the higher dose groups of Satraplatin administered. Overall, DLTs included grade 3 pneumonia (with diarrhea, hypovolemia, and nausea/ vomiting) and grade 3 elevated liver function enzymes. In sum total, 15 patients enrolled in study. There were 8 partial responses out of 11 evaluable patients. The MTD was determined to be Satraplatin 40 mg/d. Table 3. Overall response by dosage level. standard of care for this cohort includes concurrent chemoradiation . However, clearly the optimal dose and fractionation of radiation delivered concurrently with systemic agent (cytotoxic and/or biologic) has certainly not been optimized. To date, our best option includes a platinum based cytotoxic (cisplatin or carboplatin) given with radiation delivered at a total dose between 60 Gy up to perhaps 74 Gy. Table 4. NCI Toxicities by dosage level. ation arm, the response rate was 56%, and the median survival was 13.7 months. In the radiation alone arm, the response rate was 43%, and the median survival was 9.6 months (p = 0.0066). At seven years, reanalysis of this trial showed these findings to persist with 5-year survivals of 17% versus 6% respectively  . These results were confirmed in an intergroup trial by the Radiation Therapy Oncology Group (RTOG) and Eastern Cooperative Oncology Group (ECOG)  . As a single agent, cisplatin has shown response rates ranging from 0% to 35% in advanced adenocarcinoma of the lung and 0% to 33% for all forms of NSCLC . Cisplatin has been proposed as a drug which can increase radiation-induced damage to tumors [35-37] . Possible mechanisms included radiosensitization of hypoxic cells, inhibition of repair of sublethal or potentially lethal damage, increased induction of chromosomal aberrations, and binding to thiols. In vitro results suggesting radiosensitization have been confirmed by studies in animal models [38-42] . Ultimately, in randomized trials, cisplatin given daily in combination with radiotherapy improved rates of survival and control of local disease, compared to radiotherapy alone in patients with locally advanced unresectable NSCLC (p = 0.009 for radio-therapy plus daily cisplatin vs. radiotherapy alone)  . The disadvantage to cisplatin as a radiosensitizer is that it is not lipophilic and thus is not orally bioavailable. For this reason, cisplatin is usually administered every three weeks, or weekly. Also, patients must maintain adequate hydration to avoid renal toxicity. As a consequence, we do not fully exploit its radiosensitization properties. However, Satraplatin, a relatively new platinum derivative, may turn out to be at least as efficacious as cisplatin but be available in oral form with a more limited toxicity. Further studies evaluating the effect of Satraplatin combined with radiation show that the combination results in at least additive anti-tumor activity  . In one study using human lung cancer cells in vitro, Satraplatin was a more effective radioenhancer than carboplatin, and possibly cisplatin, at equally cytotoxic doses . Therefore, the aim of this study was to better characterize the optimal dose of Satraplatin to be given concurrently with radiation for Stage III NSCLC patients and to investigate the MTD and associated DLTs of the drug. Clinically, one hundred sixty-five patients treated with Satraplatin have been studied in a total of 6 single agent phase 1 trials. Three of these phase 1 trials involving single agent Satraplatin given daily for 5 consecutive days every 3 weeks were conducted in the UK, the US, and Japan, respectively [17,43,44] . The maximum tolerated doses (MTDs) in these trials were 140 mg/m2/day (UK), 100 mg/m2/day (US), and 120 mg/m2/day (Japan). The dose-limiting toxicities were generally neutropenia and thrombocytopenia. Nausea, vomiting, and diarrhea were generally mild to moderate, and were controlled with oral anti-emetics and antimotility drugs. Based on the results of these trials, the recommended phase 2 doses were 100 mg/m2/day to 120 mg/m2/day in previously untreated patients. In patients previously treated with cytotoxic drugs, the recommended dose is 80 mg/m2/day. In general, our phase 1 trial was aimed at assessing how patients responded from a toxicity stand point to concurrent Satraplatin and radiation delivered to a total dose of 63 Gy given over seven weeks. 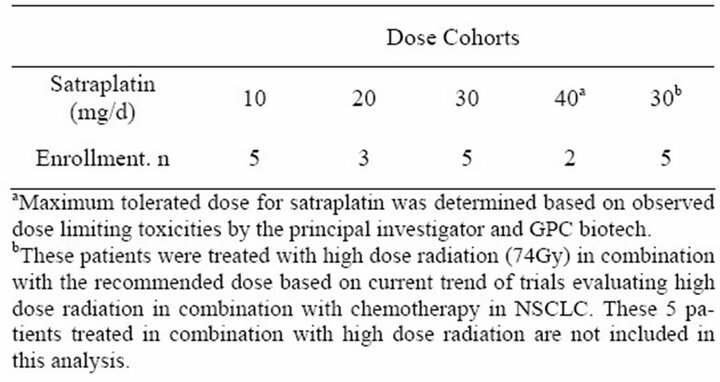 From our results, it appears that Satraplatin is well tolerated to doses as high as 40 mg/d given with 63 Gy of radiation. There were no NCI grade 4 toxicities in doses of drug ranging from 20 - 40 mg/d. There was only 1 grade 4 toxicity, pneumonia, in the lowest drug dose. There were no deaths attributable to treatment in any of the dose cohorts. There were NCI described grade 3 toxicities in all of the dose ranges. With regards to tumor outcome, there were eight partial responses out of 11 evaluable patients. We are still examining the response of patients who received 74 Gy external beam radiation given concurrently with Satraplatin. In sum total, 15 patients enrolled in study. There were 8 partial responses out of 11 evaluable patients. The MTD was determined to be Satraplatin 40 mg/d. These results provide a rationale for design of future phase II clinical studies with Satraplatin in combination with radiation therapy for the treatment of NSCLC. Lawrence, T., Ten Haken, R. and Giaccia, A. (2008) Principles of radiation oncology. In: De Vita, V., Lawrence, T. and Rosenberg, S., Eds., Cancer: Principles and practice of oncology, 8th Edition, Lippincott Williams and Wilkins, Philadelphia. Johnson, D.H., et al. (1990) Thoracic radiotherapy does not prolong survival in patients with locally advanced, unresectable non-small cell lung cancer. Annals of Internal Medicine, 113, 33-38. Furuse, K., et al. (1999) Phase III study of concurrent versus sequential thoracic radiotherapy in combination with mitomycin, vindesine, and cisplatin in unresectable stage III non-small-cell lung cancer. Journal of Clinical Oncology, 17, 2692-2699. Bonomi, P., et al. (2003) Randomized 3-arm phase II study of paclitaxel (T), carboplatin (C), and thoracic radiation (TRT) for patients with stage III non-small cell lung cancer (NSCLC). Report of locally advanced multimodality protocol (LAMP)-ACR 427. Lung Cancer, 41, S77. Zemanova, M., Petruzelka, L., et al. (2002) Concurrent versus sequential radiochemotherapy with vinorelbine plus cisplatin (V-P) in locally advanced non-small cell lung cancer. A randomized phase II study (abst). Proceedings of the American Society of Clinical Oncology, 21, 290a. Loehrer, P.J. and Einhorn, L.H. (1984) Drugs five years later cisplatin. Annals of Internal Medicine, 100, 704-713. Rozencweig, M., et al. (1977) Cis-diamminedichloroplatinum (II). A new anticancer drug. Annals of Internal Medicine, 86, 803-812. Gralla, R.J., Cvitkovic, E. and Golbey, R.B. (1979) cisDichlorodiammineplatinum(II) in non-small cell carcinoma of the lung. Cancer Treatment Report, 63, 1585-1588. McKeage, M.J., et al. (1997) Phase I and pharmacokinetic study of an oral platinum complex given daily for 5 days in patients with cancer. Journal of Clinical Oncology, 15, 2691-2700. (2004) Satraplatin, GPC biotech investigator’s brochure. Twentyman, P.R., et al. (1992) Sensitivity to novel platinum compounds of panels of human lung cancer cell lines with acquired and inherent resistance to cisplatin. Cancer Research, 52, 5674-5680. Cmelak, A.J., et al. (1999) Phase I study of JM-216 with con-current radiation in non-small cell lung cancer and squamous cell head and neck cancer (abstr). Proceedings of the American Society of Clinical Oncology, 18, 393a. Bartelink, H. (1988) Combined modality treatment for primary tumor. National Cancer Institute Monograph, 1988, 247-251. Klastersky, J., et al. (1989) Cisplatin versus cisplatin plus etoposide in the treatment of advanced non-small-cell lung cancer. Lung cancer working party, Belgium. Journal of Clinical Oncology, 7, 1087-1092. Wozniak, A.J., et al. (1998) Randomized trial comparing cisplatin with cisplatin plus vinorelbine in the treatment of advanced non-small-cell lung cancer: A southwest oncology group study. Journal of Clinical Oncology, 16, 2459-2465. Bartelink, H., et al. (1988) Combined treatment with radiation and anticancer drugs: Experimental and clinical results. In: Bartelink, H., Ed., Radiobiology in Radiotherapy, Springer-Verlag, London, 177-179. Begg, A., Stewart, F. and Dewit, L. (1987) Interactions between cisplatin and radiation in experimental rodent tumors and normal tissues. Antitumor drug-radiation interactions. CRC Press, Boca Raton, 154-170. Squibb, B.-M. (1998) Phase I study of oral bis (acetato) amine dichloro cyclohexylamine platinum (IV) (Satraplatin, JM-216) given daily x 5 (CA142-003/CA142-009). Bristol-Myers Squibb Interim Safety Report Accession No. 9100663081998. Squibb, B.-M. (1999) Phase I/II study with JM-216 and simultaneous radiation in locally advanced non-small cell lung and head and neck cancer (CA142-020), 1999. *Funding statement: This study was funded by GPC Biotech, Inc. of Princeton, NY. (GPC Biotech and Agennix Incorporated merged forming Agennix AG which is currently developing Satraplatin).